Have you seen these great new markers? They are so pretty and glittery in real life! My daughter had to do a 100 things poster for the 100th day in pre-k. Her poster turned out SO well! She used the markers to add some 'pizzazz' to her picture with sparkly grass and an especially shiny sun. Since she enjoyed the markers SO much, I thought someone out there might enjoy a pack of them too! Enter below to win your own pack of Glitter Markers! Tell me which one you follow me on. 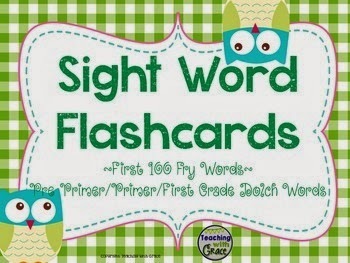 It has ANY sight word you could possibly need for Fry Words or Dolch Words up to 1st grade. 5th Grade Freebie Blog Hop- Grab your goodies!! Work Day Tomorrow... But Today?